Ekkehard Tichy was born on 26 August 1922 at Mährisch-Neustadt in the Sudetenland. In mid-1942, Tichy was posted to I./JG 53 based on the Russian front. Tichy was transferred to III./JG 3 in October 1942. Leutnant Tichy was assigned to 9./JG 3. He gained his first victory on 20 April 1943, when he shot down a Russian LaGG fighter. 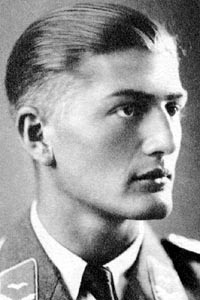 On 21 July, Tichy claimed three enemy aircraft shot down to record his fifth through seventh victories. He recorded his 10th victory on 28 July, when he shot down a Russian Yak-7 fighter. By August, Tichy had some 13 victories when the unit was relocated to the Western front to undertake Reichsverteidigung duties. On 4 November 1943, Tichy was appointed Staffelkapitän of 9./JG 3. On 18 March 1944, he was severely wounded in the eye in a dogfight with bomber escorts. He baled out of his stricken Bf 109 G-6 (W.Nr. 410 554) after shooting down a USAAF P-51 fighter. Leutnant Tichy was awarded the Deutsches Kreuz in Gold on 16 May 1944. Despite the loss of the sight in one eye, Tichy returned to combat with the Sturmgruppe, IV./JG 3 in June 1944. He was assigned to 10. Staffel. He became Staffelkapitän of 13./JG 3 on 19 July. On 16 August 1944, over 1,000 US bombers raided airfields and oil installations in central Germany. IV./JG 3 attacked a formation of bombers from the 91st Bomb Group, USAAF scoring some 12 Ab-und Herausschüsse. Tichy was killed when he rammed or collided with a B-17 four-engine bomber with his Fw 190 A-8 (W.Nr. 732 029), possibly handicapped by his impaired eyesight. Tichy was posthumously awarded the Ritterkreuz and promoted to the rank of Hauptmann. Ekkehard Tichy was credited with 25 victories. He recorded 13 victories over the Eastern front, including one Il-2 Sturmovik. Of the 12 victories he recorded over the Western front, 11 were four-engine bombers.